When apple cores, stale bread and last week’s leftovers go to landfills, they do not return the nutrients they pulled from the soil while growing. What is more, when sealed in landfills without oxygen, organic materials release methane, a potent heat-trapping gas, as they decompose. 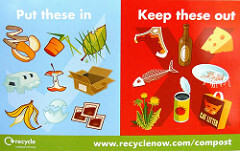 If composted, however, the food can be broken down and returned to the earth as a nonchemical fertilizer with no methane by-product. According to Josh Harkinson, recent evidence tilts in favor of of composting. A massive study by the Rodale Institute, published in Compost Science and Utilization, found that using compost for cropland sequesters a staggering 10,802 pounds more CO2 per hectare than conventional farming—that's as much as a good-sized car produces in a year. And using compost instead of raw manure for crops can also lead to less nitrate leaching, and hence less groundwater pollution. Another option, of course, is just to do... both. In Oakland, the East Bay Municipal Utility runs a facility that takes sorted food waste, puts it through an anaerobic digester, in which bacteria chomp through the waste and produce methane, which is harvested for electricity. 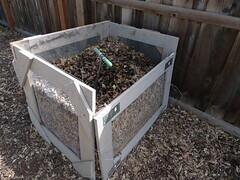 The leftover food material is then composted and used as soil fertilizer. According to the EPA, if 50 percent of our food waste went through these digesters, we could power some 2.5 million homes—and with lovely fertilizer to spare! Granted, these plants can all be pretty expensive, but they're the sorts of projects that could, in theory, qualify for carbon offsets under a cap-and-trade system. But will they? Right now, the U.S. Composting Council is worried that that won't be the case under the House cap-and-trade bill, which sets strict performance methane standards for landfills (as opposed to the Senate version, which makes landfill projects eligible for offsets). The House bill, according to the USCC, would bias waste mangers toward capturing methane emissions from landfills rather than avoiding them in the first place by diverting them toward composting centers. I haven't seen this issue fully explored anywhere, but it's worth noting.